GoCasino is famous for giving new members deposit bonus on the first 20 deposits. Players from the United States are not blocked from this gambling site. Go Casino operates with a gambling license from Curacao. 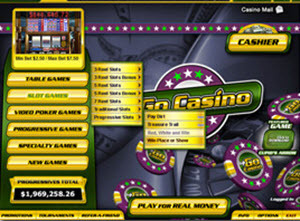 Go Casino get their games and casino gambling software from Vegas Technology, which ensures a high quality throughout. 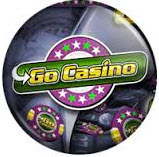 You can try out Go Casino for free using play-money. This way, you don’t have to make any deposit until you know for sure that you like what Go Casino has to offer. There is no limit to how much you can play for free using play-money. While other casinos limit this to a certain number of hours or certain games only, Go Casino wants you to try out everything they have to offer – for as long as YOU want. Go Casino has table games, slots, video poker machines, and more. The slot selection includes anything from retro-style 3-reel slots to advanced video slots. Examples of popular table games in this online casino are Progressive Blackjack, European Roulette, Craps, Baccarat, 10 High Hold ‘Em, Island Stud Poker, and Caribbean Stud Poker. At Go Casino, you get a deposit bonus on your first TWENTY deposits. If you take full advantage of this offer, you can collect $20,000 in bonus money! Go Casino often have give-aways for their active players. Go Casino are known for their generous deposit bonuses, and they are not just for new members. Each month, Go Casino arranges casino tournaments with guaranteed prize pots. All in all, at least $200,000 is won in these tournaments each month. The largest individual prize pots contains $25,000 guaranteed. Some of the tournaments are free rolls while others have a buy-in from $2 to $25. Most of the tournaments are slot tournaments, but table game tournaments are also available for Blackjack, Roulette and Casino Hold’em. There are even tournaments for video poker, which is quite rare online. As an active member at Go Casino, you may be invited to special invite-only free tournaments. Some of these have guaranteed prize pots as high as $75,000. Go Casino’s support is staffed 24/7 every day of the week.